Are your having drafting problems? When a chimney is having drafting problems there are many issues that can arise. Similarly, there are many reasons that a drafting problem may occur. A chimney that is improperly sized can cause a drafting problem to occur. Also, a chimney that is too close to nearby trees or other tall buildings can also develop a drafting problem. When a chimney does not draft properly, you can have multiple problems. This can include: smoking issues, creosote build up, and a cold draft in the winter. Chimney draft problems can be a real pain. There are chimney draft stoppers available to solve such issues.When a chimney flue is too small for a firebox, smoke cannot draft up through the chimney. Round flues should have a 12:1 ratio to the firebox. Chimney systems that do not comply with this ratio will, generally speaking, have draw problems. One chimney draft stopper in this situation is a Smoke Guard. A Smoke Guard will actually reduce the size of the firebox to help it draft better. A properly sized firebox will draft properly. 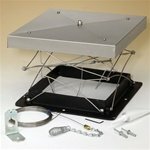 A Smoke Guard will also prevent a cold draft from coming down the chimney in the winter. Another chimney draft inducer is improper chimney height. The chimney needs to be the highest point for about ten feet around in order for it to draw properly. Poor draft is absolutely of an issue because, first and foremost, it decreases your fireplace’s efficiency. A fire burns the warmest when there is a steady flow of oxygen. When a chimney doesn’t have enough air inside the home to continually supply it, it has to start to draw air from the outside, that is, down through the chimney. This is known as negative pressure inside your home, and this is the reason that many people experience smoking problems when you burn a fire. This negative pressure issue plays into chimney height issues and surrounding trees. If the chimney is too short then it is less difficult for a fire to start drawing air from down the flue system, and nearby trees can actually help force air down the chimney. One of the best ways to help turn your negative pressure to positive pressure is to crack a window near the fire when you are burning one. This will give the fire a fresh air source to draw from correcting the downdraft. Poor chimney draft is a real pain and it can actually contribute to creosote build up in your flue system. Creosote, before it turns into a sticky or even glazed substance in your flue system is a gas, a product of combustion from the fire burning. When the flue system stays warm the products of combustion can float safely out of your chimney, however, if there is cold air being sucked into the chimney due to a draft, more creosote will solidify and stick in the flue system than will float away. All of these problems presented by a drafty chimney can generally be corrected. Installing a stainless steel liner will reduce the size of a flue system that is too large. This is a means of fixing an improperly sized flue system, opposite to using a Smoke Guard to reduce the size of a firebox that is too large. 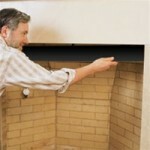 There are special, top sealing chimney caps that will eliminate draft when the chimney is not in use. These chimney caps have a damper system that will completely seal off the top of the chimney when closed in order to prevent cold air from coming down the chimney and into the home. Finally, if your chimney height was not correct, say it was constructed too short, adding a few feet of height onto the chimney will help it to draw properly. This is one of the more extreme draft fixes, however. All of these chimney draft stoppers combat chimney draft inducers in different ways. You may want to call a chimney professional to diagnose exactly why your chimney is experiencing a drafting problem or any of the problems that come with a drafting problem. After diagnosis, repair is usually straightforward.